Welcome to the house of . For more colorful and fabulous clothing ideas for women, please click on link "Classic Wear" above title...!! OCCASION: Perfect for small get-together with friends, dance parties and more. 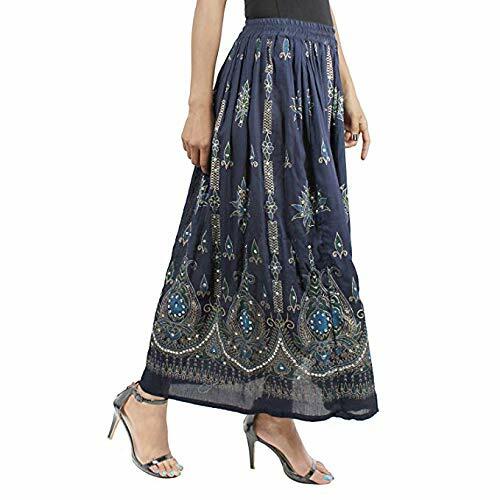 This skirt will give an ethnic look to your personality. This season get ready to flaunt your style with this beacutiful skirt from the house of "". FEATURES: A must have, this skirt will make you dazzle. Embellished with numerous iridescent silver sequins with floral print in slightly contrasting colors outlined with golden paint, the fall allows for carefree movement. Match this skirt with the funky accessories & colorful tops. Available in vibrant color options. NOTE: Please kindly note, all the sizeings are done manually, so please allow minor deviation in sizing. Also, actual product color may from that shown in image, due to different monitor and screen settings.